This article is about the song written by Kenneth Gamble, Leon Huff and Cary Gilbert. For the Tina Turner song, see Don't Leave Me This Way (Tina Turner song). "To Be Free to Be Who We Are"
"Tell the World How I Feel about 'Cha Baby"
(1976) "Don't Leave Me This Way"
(1977) "Reaching for the World"
"Don't Leave Me This Way" is a song written by Kenneth Gamble, Leon Huff and Cary Gilbert. First charting as a hit for Harold Melvin & the Blue Notes, an act on Gamble & Huff's Philadelphia International label in 1975, "Don't Leave Me This Way" was later a huge disco hit for Motown artist Thelma Houston in 1977. The song was a major hit for British group The Communards in 1986. The Blue Notes' original version of the song, featuring Teddy Pendergrass' lead vocal, was included as an album track on the group's successful album Wake Up Everybody released in November 1975. Though not issued as a single in the United States at the time, the Blue Notes' recording reached #3 on the US Billboard Disco Chart in the wake of Thelma Houston's version. The song proved to be the group's biggest hit in the UK, #5 on the UK singles chart, when released there as a single in 1977. It became the title track of a budget LP issued on the CBS Embassy label in the UK in 1978.> The track was finally issued as a 12-inch single in the US in 1979, coupled with "Bad Luck". "Today Will Soon Be Yesterday"
"You've Been Doing Wrong for So Long"
(1976) "If It's the Last Thing I Do"
"Don't Leave Me This Way" was covered by Motown in 1976. Originally assigned to Diana Ross, it was intended to be the follow-up to her hit "Love Hangover" but was reassigned and given to the upcoming Motown artist Thelma Houston instead. Studio musicians on the track included James Gadson on drums, Henry E. Davis (of the band L.T.D.) on bass, and John Barnes on keyboards. Following the release of her third album Any Way You Like It, a Boston record pool unanimously reported positive audience response to "Don't Leave Me This Way" in discos, and the song was selected for release as a single. Houston's version became a massive international hit, topping the soul singles chart and, nine weeks later, the Billboard Hot 100 for one week in April 1977. The song peaked at #13 in the UK. The song went to number one on the disco chart. Later in the year, it was featured on the soundtrack of the movie, Looking for Mr. Goodbar. In 1978, "Don't Leave Me This Way" won the award for Best R&B Vocal Performance, Female at the 20th Annual Grammy Awards. Houston's version was revived in 1995 in several remixes, which reached #19 on the US Billboard Dance Chart and #35 in the UK. This version got Houston ranked #86 on VH1's "100 Greatest One-hit Wonders", as well as the #2 spot on their "100 Greatest Dance Songs" list. The 1994/1995 remixes are: R&B vs 4:00 | Remix radio vs 4:00 | 7” radio edit 4:00 | Club remix vertigo 5:40 | House club remix 5:40 | Factory team remix 5:50 | U.S. club edit 5:50 | Serious rope club remix 7:10 | Serious rope 7” remix 4:10 | Jazz voice's classic club trax 6:10 | Jazz voice's dub mix 7:35 | Xs'2 house pump mix 7:30 | Joe T. Vanelli dubby mix 8:40 | Joe T. Vanelli light mix 5:20 | Joe T. Vanelli Radio Cut 3:54 | Joe T. Vanelli Extra Dubby 5:17 | Junior sound factory mix 9:30 | Tribe dub (acid vocal) 7:20 | Junior's factory dub 9:30 | Junior gospel dub 7:55 | Junior's Tribe Prank Mix and Radio Edit 3:20. Throughout the 1980s and 1990s, Houston's version of the song became an unofficial theme song for the AIDS epidemic in gay male communities of the west. American artist Nayland Blake created a work for American Foundation of AIDS research about the epidemic that referenced the song and its significance in the community. An art exhibition at the National Gallery of Australia entitled "Don't Leave Me This Way - Art in the age of AIDS" opened in 1994 containing various works about the epidemic. A 246-page publication of the exhibition also followed. (1986) "Don't Leave Me This Way"
(1986) "So Cold The Night"
The song was covered by The Communards in a Hi-NRG version. This recording topped the UK charts for four weeks in September 1986, becoming the biggest selling record of the year in the process. The featured guest vocalist was the female jazz singer Sarah Jane Morris. The song became a Top 40 hit on the US Billboard Hot 100 and topped the Billboard Dance chart. In 2015 the song was voted by the British public as the nation's 16th favourite 1980s number one in a poll for ITV. Several remixes were issued, notably the "Gotham City Mix" which was split across two sides of a 12" single and ran for a total of 22 minutes 55 seconds. The album liner notes dedicate the song to the GLC. Dami Im covered the Houston-inspired version on 1 September 2013 during Week 3, Top 10 Hits Themed Round of the fifth season of The X Factor Australia competition. Her performance was received by an unanimous standing ovation from all four judges and audience. It was her third consecutive standing ovation since Week 1 of the Live Shows and her performance of the song debuted on the ARIA Singles Chart at number 67. Im went on to win the competition and received a contract with Sony Music Australia. Later that year, Im recorded a version for her self-titled album. The album debuted at #1 in the Australian Charts and was certified platinum. A version of the song is featured in the stage musical, Priscilla Queen of the Desert – the Musical during a funeral scene. The Eurodisco song "Yes Sir, I Can Boogie" by Baccara (1977) borrows heavily from this song, sharing the intro and the bass line but with a different chorus line. Episode 6 of the 2004 BBC miniseries Blackpool featured the Communards version, accompanied on screen by the singing and dancing of the characters, as part of the story. The 2012 song "Lying Together" by French Kiwi Juice samples vocals from Houston's cover. ↑ Andrew Hamilton. 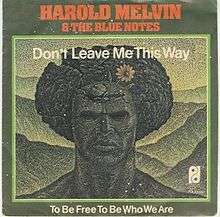 "Don't Leave Me this Way - Harold Melvin & the Blue Notes | Songs, Reviews, Credits". AllMusic. Retrieved 2016-10-10. ↑ "Allmusic – Harold Melvin & the Blue Notes – Billboard singles". Retrieved 2008-12-03. ↑ "swedishcharts.com". Retrieved December 3, 2008. 1 2 "everyhit.com search results for "Don't Leave Me This Way"". Archived from the original on March 19, 2008. Retrieved December 3, 2008. ↑ "RUSS/RALPH...Bass player on Love Hangover & Dont Leave Me This Way???". Soulfuldetroit.com. Retrieved 2016-10-10. ↑ Stibal, Mary E. (October 1977). "Disco—Birth of a New Marketing System". Journal of Marketing. American Marketing Association. 41 (4): 82–88. doi:10.2307/1250240. ↑ Whitburn, Joel (2004). Top R&B/Hip-Hop Singles: 1942-2004. Record Research. p. 262. 1 2 3 4 "Official Charts > Thelma Houston". The Official UK Charts Company. Retrieved March 28, 2016. ↑ "Past Winners Search". Grammy Foundation. Retrieved January 15, 2014. ↑ Cosgrove, Stuart (May 10, 1995). "Don't leave me this way". The Independent. London. ↑ Kent, David (1993). Australian Chart Book 1970–1992 (illustrated ed.). St Ives, N.S.W. : Australian Chart Book. p. 142. ISBN 0-646-11917-6. ↑ "Austriancharts.at – Thelma Houston – Don't Leave Me This Way" (in German). Ö3 Austria Top 40. Retrieved June 15, 2013. ↑ "Top RPM Singles: Issue 4701a." RPM. Library and Archives Canada. Retrieved June 15, 2013. 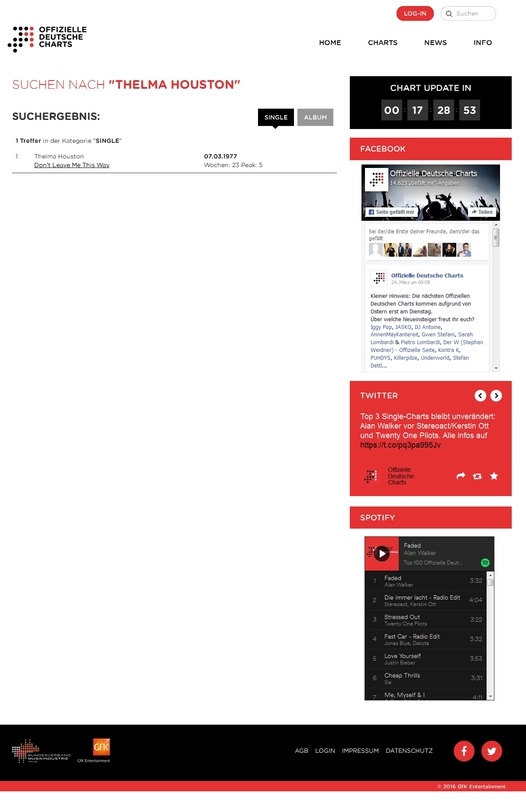 ↑ "Offizielle Deutsche Charts > Thelma Houston (single) (screen shot of search results from offiziellecharts.de)" (in German). GfK Entertainment. Retrieved March 28, 2016. ↑ "Charts.org.nz – Thelma Houston – Don't Leave Me This Way". Top 40 Singles. Retrieved June 15, 2013. 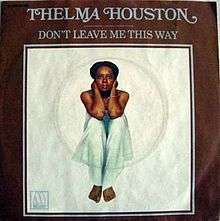 ↑ "Swedishcharts.com – Thelma Houston – Don't Leave Me This Way". Singles Top 100. Retrieved June 15, 2013. 1 2 3 4 "Allmusic – Thelma Houston – Billboard singles". Retrieved 2008-12-03. ↑ "Cash Box Top 100 4/16/77". Tropicalglen.com. 1977-04-16. Retrieved 2016-10-10. ↑ "Australian Chart Book". Austchartbook.com.au. Retrieved 2016-10-10. ↑ "Image : RPM Weekly - Library and Archives Canada". Bac-lac.gc.ca. Retrieved 2016-10-10. ↑ "Old-Charts". Old-Charts. Retrieved 2015-11-12. ↑ "Top 100 Hits of 1977/Top 100 Songs of 1977". Musicoutfitters.com. Retrieved 2016-10-10. ↑ "Cash Box YE Pop Singles - 1977". Tropicalglen.com. 1977-12-31. Retrieved 2016-10-10. ↑ Robbins, Ira; Rompers, Terry. "Bronski Beat". Trouser Press. Retrieved 25 October 2013. 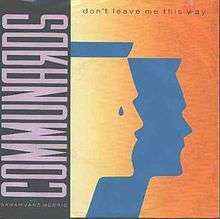 ↑ "Reviews > Dance > Picks > Communards – Don't Leave Me This Way". Billboard. Nielsen Business Media. 98 (38): 73. 20 September 1986. ISSN 0006-2510. ↑ Morris will record later (2001) an acoustic version of the song, included in her album "August"
↑ Whitburn, Joel (2004). Hot Dance/Disco: 1974-2003. Record Research. p. 62. ↑ Westbrook, Caroline (25 July 2015). "The Nation's Favourite 80s Number One: 12 more classic 80s chart-toppers which didn't make the cut". Metro. Retrieved 27 July 2015. ↑ Kent, David (1993). Australian Chart Book 1970–1992 (illustrated ed.). St Ives, N.S.W. : Australian Chart Book. p. 72. ISBN 0-646-11917-6. ↑ "Austriancharts.at – The Communards – Don't Leave Me This Way" (in German). Ö3 Austria Top 40. ↑ "Lescharts.com – The Communards – Don't Leave Me This Way" (in French). Les classement single. Retrieved 21 July 2013. ↑ "Offiziellecharts.de – The Communards – Don't Leave Me This Way". GfK Entertainment Charts. ↑ "Chart Track: Week 39, 1986". Irish Singles Chart. ↑ "I singoli più venduti del 1986". HitParadeItalia (in Italian). Creative Commons. Retrieved 1 June 2013. ↑ "Nederlandse Top 40 – The Communards search results" (in Dutch) Dutch Top 40. ↑ "Charts.org.nz – The Communards – Don't Leave Me This Way". Top 40 Singles. Retrieved 21 July 2013. ↑ Salaverri, Fernando (January 1987). Sólo éxitos: año a año, 1959–2002 (1st ed.). Spain: Fundación Autor-SGAE. ISBN 84-8048-639-2. ↑ "Swisscharts.com – The Communards – Don't Leave Me This Way". Swiss Singles Chart. ↑ Roberts, David (2006). British Hit Singles & Albums (19th ed.). London: Guinness World Records Limited. p. 117. ISBN 1-904994-10-5. ↑ "Dami Im - Week 3 - Live Show 3 - The X Factor Australia 2013 Top 10". ↑ "The X Factor Australia Live Show – Dami Im Steals the Show Once Again with a Disco Track!". Take 40 Australia. MCM Entertainment. 8 September 2013. Retrieved 23 October 2013. ↑ Ryan, Gavin (14 September 2013). "ARIA Singles: Redfoo Is Number One". Noise11. Noise Network. Retrieved 14 September 2013. ↑ Knox, David (2013-10-30). "Dami Im wins The X Factor 2013 – TV Tonight". Tvtonight.com.au. Retrieved 2016-10-10. ↑ Steffen Hung. "Dami Im - Dami Im". Australian-charts.com. Retrieved 2016-10-10. Collectors' Item: All Their Greatest Hits! "Hope That We Can Be Together Soon"
"You Used to Hold Me So Tight"